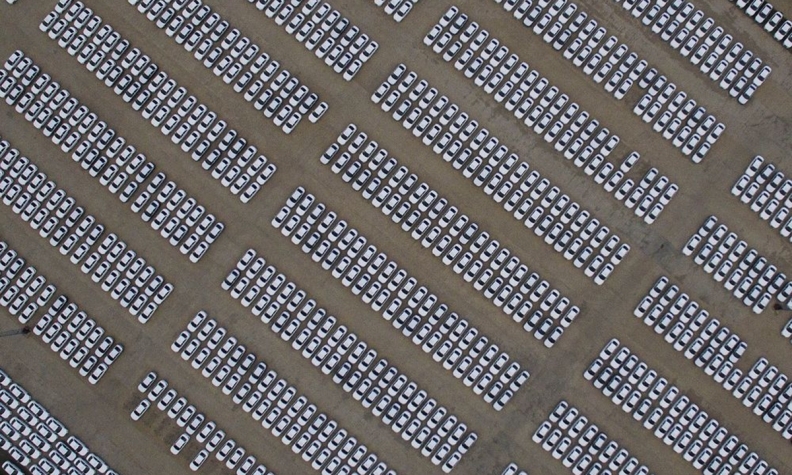 Audi cars sit in a FAW-Volkswagen Changchun plant parking lot. SHANGHAI -- Chinese government-owned auto giants such as SAIC Motor Corp. and Dongfeng Motor Group may see billions of dollars in profits evaporate if the government lifts protectionist measures and lets foreign companies operate without a local partner. China requires overseas carmakers such as General Motors, Toyota and Volkswagen to form joint ventures with locals in order to sell their brands in the world’s biggest market. The policy enacted two decades ago capped foreign investment at 50 percent, helping local brands develop manufacturing expertise while still profiting from sales of foreign marques. Those alliances seem to be working for domestic automakers, which earned 67 billion yuan ($9.7 billion) with their partners in 2014, according to the latest China Association of Automobile Manufacturers statistics. Yet the government may relax the restriction as it tries to make state-run businesses more efficient and to respond to changes in trade policy being pushed by U.S. President Donald Trump. The prospect for lifting the restrictions comes as carmakers meet in Shanghai this week for Asia’s biggest auto show. Ford Motor Co. and Hyundai Motor Co. are among the other foreign carmakers displaying models that compete with those produced by local partners. Less than half the record 23.9 million cars and light trucks sold in China last year were local brands. Market share for Chinese-brand cars has stayed fairly constant, reaching 43 percent last year from 41 percent a decade ago, according to the state-backed manufacturers association. GM, Volkswagen and Nissan all count China as their biggest market by sales volume, and they may potentially earn billions of dollars more in profits if they had more control over their Chinese operations. The market has higher profit margins than the U.S., Europe and Japan, according to Bloomberg Intelligence data. Ford CEO Mark Fields said that tangible reforms and opening up are needed in the China car market. Ford partners with Chongqing Changan Automobile and Jiangling Motors. Renault's Asia-Pacific Chairman Francois Provost said at the show that the French carmaker’s joint venture with Dongfeng Motor was “doing well.” BMW has a tie-up with Brilliance China Automotive Holdings Ltd., while Daimler partners BAIC Motor Corp. Some lane changes already are coming. Starting July 1, car dealers can sell vehicles from multiple brands in the same store without first getting clearance from the makers. In addition, automakers no longer can force dealers to put unpopular models on display. Debate on altering or even eliminating the percentage cap dates to at least 2013, when a commerce ministry official said carmakers should prepare for such a move. That was reiterated last year by the then-chairman of China’s economic planning agency. Most recently, China was ready to relax the policy during President Xi Jinping’s visit to Florida earlier this month for a summit with Trump, according to Bloomberg BNA. U.S. trade relations with China were a cornerstone of Trump’s campaign as he accused the nation of unfair trade practices and threatened to slap a levy on Chinese products of as much as 45 percent. He ordered a study to identify the forms of “trade abuse” that contribute to U.S. deficits with all foreign countries. One local argument for removing the cap is that it would force Chinese automakers to innovate and improve the quality of their vehicles. Zhejiang Geely Holding Group Co., owner of Volvo Car Group, is one automaker advocating a change. Local manufacturers still are in the early stages of brand building, Great Wall Motor Co. Chairman Wei Jianjun said. CAAM has pushed back in the past, with its then-leader saying in 2014 that local brands would be “killed in the cradle” if the cap was lifted. Three of the largest state-owned carmakers by sales volume -- SAIC, Dongfeng and Guangzhou Automobile Group -- earned a collective $7.7 billion in net income last year, almost quadruple their profits in 2007, according to data compiled by Bloomberg. Yet that surge is fueled largely by record sales of foreign-branded cars to the middle class. Their own brands remain little-known outside China and mainly occupy the low end of the market. For Shanghai-based SAIC, the biggest carmaker with production ventures with GM and Volkswagen, about 6 percent of the 5.67 million passenger vehicles it sold last year carried its own nameplates such as MG and Roewe. As China works to rebalance its economy, the joint-venture rule is an obstacle to a more market-oriented auto industry, said Jochen Siebert, the Singapore-based managing director of JSC Automotive Consulting. Currently, foreign companies often prop up their domestic partners to help them stay in business and keep the assembly lines rolling. If the cap is lifted, some partnerships would take years to unravel as the parties haggle over the price. Yet carmakers owned by local governments may dissolve their marriages quickly so officials can use the proceeds to invest in ventures such as improving public transportation, Siebert said. “Rebalancing would lead to a much more efficient and healthy automotive industry in China,” he said.